ENJOY UP TO $3600 CASH ON TOP OF ALL OTHER INCENTIVES! To thank you for your awesome support, we’ve revised our Loyalty Incentives to make them better than ever! 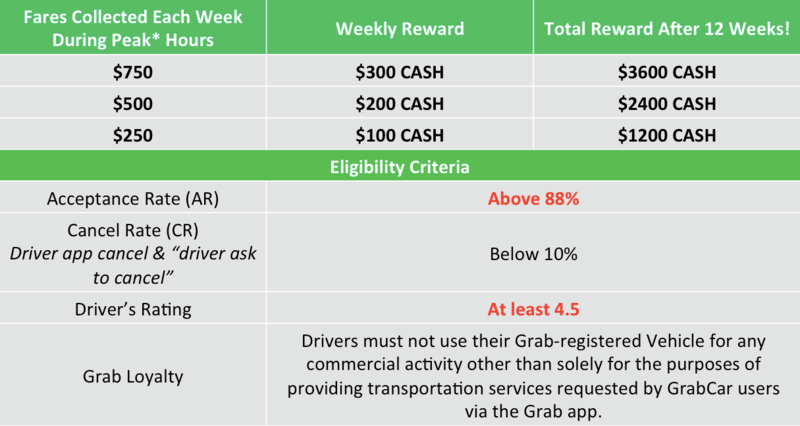 Just drive exclusively with Grab and collect $250 to $750 in peak hour fares* weekly to enjoy! Achievable with just 18 to 55 trips each week (or 3 to 8 trips each day), we’ve made it really easy for you to earn that extra $3600! Eligible applicants will be enrolled into this loyalty program for 12 weeks starting from the first Monday after sign up.